Your IG is LOST-What should you do NOW??? Unfortunately, we have lots of experience in helping IG owners look for their lost iggies. This breed is notorious for running away when you least expect, climbing over very tall fences or digging under them, and bolting out of front doors. FIRST-Calm down and take a deep breath-read through this entire article-there is info you need to know while out searching- and then start getting the word out to every friend, relative, and neighbor that can help you POST FLYERS today. Do not search on your own for a day or two. Time is of the essence in locating this breed alive. It is imperative to get flyers up everywhere starting where your dog was last spotted and working your way out to a 3-5 mile radius in all directions. These guys run FAST when they are scared and can easily travel miles within days-even the very small ones; they can cover much ground in a short amount of time if they stay on a straight path. Use a team effort and assign areas to your volunteers to cover ground quickly-keep up with where you have posted. Do not assume they will not cross a busy intersection-many do it, so put flyers on the other side as well. Posting flyers just in your neighborhood is not enough. Use page protectors for bad weather. Take a roll of tape and a stapler with you when posting flyers. Be sure to post at establishments that throw food out or have dumpsters with food such as convenience stores and restaurants. 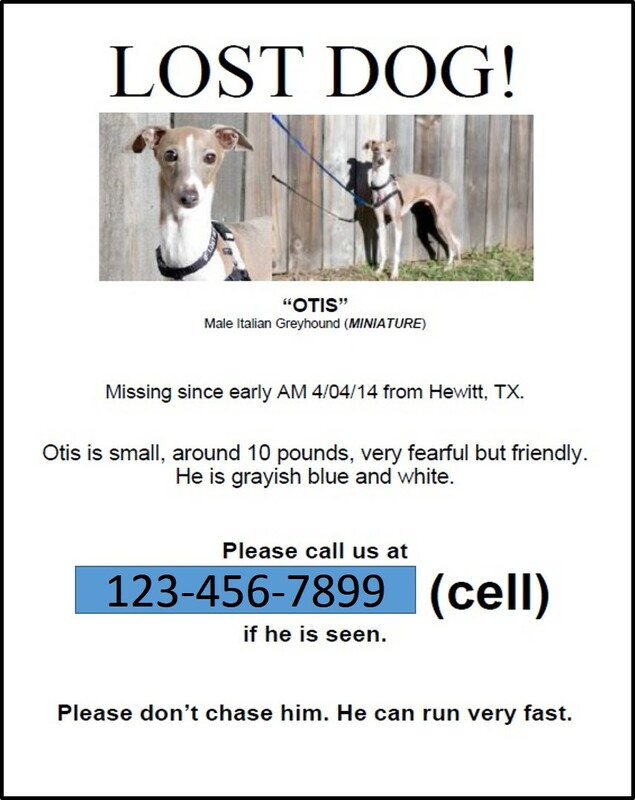 TO MAKE A FLYER FOR FREE- please go to Helping Lost Pets-Lost Dogs of Texas to make a flyer and get the social media blitz started. This is a non-profit group set up to help lost pets find their way home. There are no charges for their services-- if you navigate away now to make your flyer, be sure to come back and finish reading the infomation here. The photo in this article is a sample of what to include in your flyer. A standing photo of your IG is best if you have one, if not be sure to include a profile picture of the breed so people know the silhouette to look for. Most people do not know what an Italian Greyhound is and may be looking for a full size greyhound, so put MINI Greyhound on your flyer. Print on neon colored paper if possible. Flyers WILL BRING YOUR DOG HOME. We had one escape through a loose fence picket that was returned 16 days after being lost because someone saw his flyer in a Starbucks. He recognized the dog and new he was living in the woods near his neighborhood-he was found 4 miles from the house he escaped from! We do not recommend posting your flyer with a REWARD on it. This will encourage people to chase your dog, or not contact you with a sighting so they can find them first. The last thing you want is someone chasing your IG into a busy intersection-this has sadly happened to us before. Do not give up after a couple of days-stay vigilant and encourage your volunteers to do the same. We sometimes find these guys weeks after they have gone missing. Do not assume that your IG will find his own way home even if he has done it in the past. He may have run very very far this time, and is genuinely lost-he needs help to get back home safely. 1) Contact your local shelters and get help to walk through them daily if possible. Just calling is not enough. There are too many dogs in most shelters for the person that answers the phone to really know what has come in. In addition, most people have no idea what an Italian Greyhound is. They are frequently listed as Whippets or Chihuahua mixes when in shelters. 2) Hand deliver or fax a copy of your flyer to the local police department, vet clinics, emergency animal hospitals, and shelters within your surrounding area. Google search will bring them right up for you. Some people will take a lost dog to the vet when they find him/her or travel to what they THINK is the closest shelter which could be miles away from where the dog was lost. Smaller police departments often cover the animal control duties during after hours or holidays. Otis-dog on sample flyer was missing for 7 days during harsh winter weather- he was returned to his owner after a finder took him to a local clinic that had his flyer! Calling is not enough because you speak to one person that answers the phone-send that flyer so it can be posted at the front desk and call to be sure they got it! 3) Share his flyer on Face Book and ask people to share it/post it, especially if they live or work in the general area he escaped from. Send us one too, igrescuetexas@gmail.com, and we will post it on our Rescue FB Page. We sometimes get close to 100 shares within days! 4) Ask the local postman and pizza delivery guys if they will take a flyer with them on their routes to be on the lookout in the general area. Sometimes the ‘mom and pop’ pizza places will even offer to tape your flyer to the top of pizza boxes-ask them. 5) Ask permission to post flyers in the front window of heavy trafficked businesses (grocery stores, diners, day cares) in your community. It is amazing how nice folks can be, but be sure to keep a log of where you have posted so you can remove them. 6) Post a lost dog ad on Craigs List under PETS and LOST AND FOUND and check found dog ads there frequently. Be sure to renew you CL ad frequently so it stays at the top of the page. 7) If you have an HOA-see if they would be willing to send out an email blitz about your lost iggy. This will reach all your neighbors in an efficient time-frame. 8) If he is wearing a rabies tag-call the vet that issued it and put them on alert that he is missing. Some people will call the number on the tag. 9) If micro-chipped be sure to alert the chip company and verify that your information is current. They also sometimes have services available to their clients to assist with pet recovery. 11) Be sure to also look for him after dark. After the initial FLIGHT wears off and he finally stops running, he will likely be very scared and will instinctively go into survival mode, which may include hiding during the day time hours. Most of these guys are a bit skiddish by nature already, and will sometimes hunt for food under the security of darkness. Even a friendly, outgoing IG will go into survival mode and begin to hide when lost. Especially if they are injured or have had a run in with a stray or wild animal, but hunger will bring them out when they feel safest to look for food. 12) Locate obvious water sources in your area and check them frequently, including after dark. 13) When you are calling for him, be sure to sound happy and upbeat and call out his name along with something that gives him a "good" feeling. "Let's go for a walk", "Time for a cookie" whatever phrase you use that signals something good to him. Frantically calling his name will come across with fear in your voice, and he may interpret this as a signal to stay hidden. If you shake a treat bag or jingle keys for a car ride-do those things while out looking. Also be sure that those helping you search know the actual name you frequently call your dog. Sometimes that is different than their ‘formal’ name. Be sure that name is on the flyer as well. 14) If you have another dog in your home, leash them up and take them with you on your walks searching. If you can get them to bark ever so often even better. He may catch the familiar scent or hear the familiar bark this way. 15) Leave an article of your clothing that you have worn for the day in the area the dog was last seen along with a bowl of water and a note asking they not be removed and why. Maybe leave his/her dog bed there as well. Do not leave food as this will attract other animals that may deter a visit from your dog. There is an article that talks about lost dogs finding familiar scents and coming to them. Apparently some hunters use this technique when their hunting dogs are lost in the woods. 16) Be sure to back track areas you have already searched and keep checking that your flyers have not blown away or been removed. 17) VERY IMPORTANT-please be sure to post updates frequently. Sightings will motivate people to stay on the watch but they need to know about them. Be sure to post your updates with us as well. We sure do hope that something in this list will help bring your iggy home safe. PUT A COLLAR with TAGS on your IG and be sure they wear it 24/7. IGs get lost when we don’t expect it to happen. Putting a collar on your dog just for outings does not cover the much more common escapes that happen from the security of their home-we get messages weekly from owners looking for their lost IGs. If your IG is wearing a collar with tags the chances of him finding you immediately sky rocket. If someone sees a dog running down the street with no collar on he is ‘just a stray’ and they keep moving. To make things worse, due to their thin coats and skin and fine bone structure and build this breed can look like a scruffy unloved and sickly stray after just a couple of days on their own. If he has a collar and tags on he ‘is someone’s lost baby’ and people will make an effort to stop and read the tags and CALL YOU. *If you are worried about tags getting caught on something look into a boomerang type tag that lays flat on the collar or a collar with your information embroidered or printed directly on it. Both are easy to find on the internet. Get your dog microchipped and KEEP THE INFO UPDATED. Chips are the second best defense in getting your IG home safely, especially if he turns up in a shelter. They DO NOT replace a collar and ID tags but are very important as collars can come off. Both are essential, but there are still many people that do not know to take a found dog to be scanned for a chip. Even if your dog looks perfectly fine, be sure to go in and get a check-up by your vet. Scavenging hungry dogs will eat many things they normally would not, so you want to be sure he is unharmed on the inside as well. We have seen a few that had to be treated for organ damage so catching it early (before obvious symptoms appear) is very important. ~Please be aware that IGs are sighthounds and must NEVER be off leash outside of a securely fenced area, no matter how well they are ‘trained.’ This is the #1 reported reason for escape from owners missing their IG-even if they have not had a problem for years with this practice. It is impossible to know when an IG's sight hound instincts are going to be triggered and kick in-when this happens they take off and no amount of training, commands, or recall will stop them. Always on Leash-NEVER TRUST. ~Another very common escape scenario we hear about is IGs being left in a fenced yard while owners are gone, or having access to the yard through a dog door when their people are all gone. They are known to go over as high as an 8 ft stockade fence if spooked, if they are in search of their family, or simply going after something on the other side that sparks their sight hound interest. ~Thirdly- bolting out the front door when it is answered or running through back yard gates left open by children or yard service personnel. Put a baby gate or other barrier at the front door to prevent bolting out and a lock on that gate.